Annah Stretton is a designer from New Zealand, based in Morrinsville. She was best known for the label Annah.S. with which she opened her stores in 1992, before rebranding to her full name of 'Annah Stretton' in 2003. Her 2003 designer T-shirt promoted awareness of Breast Cancer and 100% of the profits of every sale were donated to The New Zealand Breast Cancer Foundation. 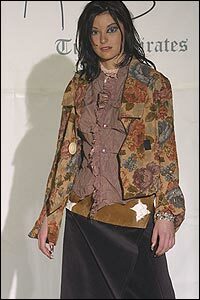 Finding inspiration from vintage clothing, she designed clothes for her collection, Time Pirates, which showed at L'Oréal Fashion week 2003. Her interest in the styles of many different eras is expressed in a rich combination of fabrics and accessories including safety pins, jewels, pearls and luxurious embroideries. The Cycle of Fashion: Fashion is fuelled by conversion, but what relevance does the fashion cycle have today in Western society's culture of mass consumerism? Fashion in Weimar Germany: Fashionable images of the 'New Woman' with short bobbed hair and masculine clothes are rooted in the sociological background of Germany in the 1920s. Fashion and the 'Antwerp Six': Antwerp's contemporary position as an international centre of fashion can be traced to the impact of these six talented designers in the 1980s.